The AED wall box Basic Cabinet has been designed to be hung on an internal solid wall and to store any of the following AED HeartStart Models: HeartStart 1, HeartStart OnSite, HeartStart FRx and HeartStart FR2. The AED wall mount Basic Cabinet is highly visible so that all are aware of the AED’s location and availability. 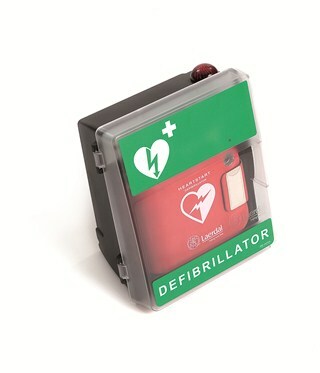 Its intuitive design makes ease of opening obvious so that the enclosed AED can be accessed quickly should it be needed. Once opened and the AED removed, a red light on the top of the box will start to flash to alert passers by that an emergency situation is occurring so that an emergency situation is occurring so that they may offer assistance. There is also an optional siren that will begin as the cabinet door is opened but users can choose to disable this function. The AED wall box Basic Cabinet is marked according to the latest ERC recommendations. Every wall box includes a set of stickers with the word Defibrillator printed in several languages.